Have you noticed that the options for interior design marketing have radically changed in the last 5 years? Welcome to the Online Age! Social media, websites, blogs, forums, e-zines, directories and source books… the options can seem limitless, as well as overwhelming. What hasn’t changed much is what we, as interior designers and decorators, need to create in order to have something to market. This is a portfolio – a collection of design projects that best exemplify who we are and what we can do for our clients. If you are fresh out of a design program this can be a particularly daunting task. You may not have any projects and while your design school projects are great for getting a design firm job, they tend to be too theoretical for real clients to understand. If you have some completed projects, you know that the design drawings created for your project do not always translate into “marketing” drawings without some additional work. Creating marketing drawings requires additional time and money. You also need to get your projects professionally photographed. Digital photography has revolutionized interior design photography. However it is still very specialized – requiring skill, specific lens, tools and software. In addition, post-production work such as color balancing, cropping, and editing work can cost extra. Professional photography remains one of the largest costs designers incur. Whether you are interior designer or decorator just starting out or one that already has projects – you need to get your work out there so that it is working for you. Today, designers are expected to have an online presence. However, the wait time on project completion, photography costs and post-project drawing production can really slow your portfolio creation and interior design marketing efforts down. While there are many types of software to help create designs the output formats are different for each, which makes it difficult and time-consuming to upload our work to different online platforms. And once you are online, it’s hard to generate content to keep our online presence fresh. So how do we get our design work out there in a way that is cost effective, efficient and maintainable? RoomSketcher Home Designer is an easy-to-use floor plan and home design software that you can use to plan and visualize interior design projects online. With a RoomSketcher Pro subscription you can create professional 2D and 3D Floor Plans and stunning 3D Photos of your designs at the click of a button. Multiple output formats give you the flexibility to print and download your work effortlessly. In addition, integrated online and mobile features make sharing and promoting your work a snap! Today’s design customers have come to expect 3D visualization for design projects. Impress potential clients and get the competitive advantage by including it in your design services. Unlike other interior design software, RoomSketcher is easy-to-use – no training is required. Create sophisticated 3D Floor Plans, 3D Photos and interactive Live 3D visualizations of your interior design projects – quickly, easily and affordably. Draw your project floor plan in minutes with RoomSketcher Home Designer. Then start adding your fixtures, finishes and furniture from the RoomSketcher Product Library, which contains more than 5,000 brand-name and generic items. While you draw, a virtual 3D model of your floor plan is generated. 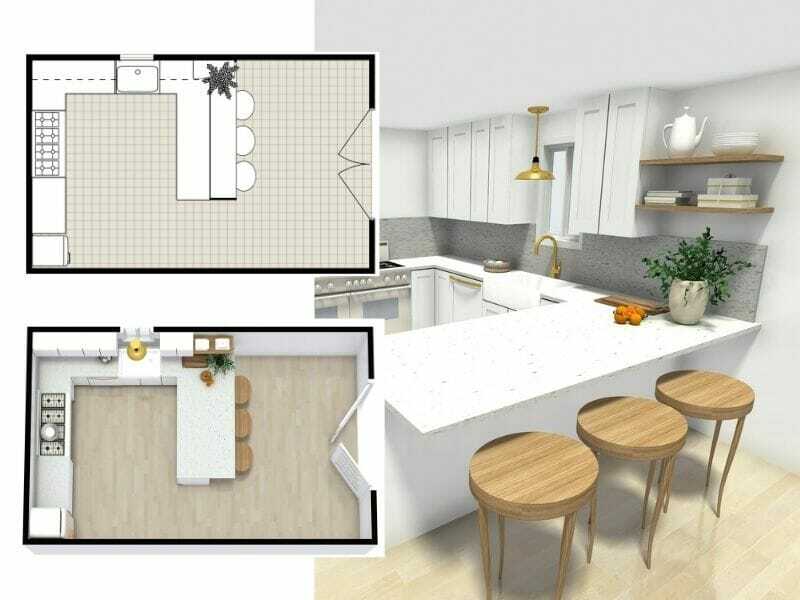 Once your floor plan is complete, the RoomSketcher state-of-the-art rendering and 3D visualization technology allows you to visualize your interior design in stunning, full-color 3D at the click of a button. Present your interior design and decorating projects with clear high-quality 3D floor plans. RoomSketcher 3D Floor Plans make it easy for your potential clients to easily understand your project floor plans, furniture layouts and the potential of your designs. An easy-to-use camera tool lets you take instant Snapshots to see any part of your design in 3D. Save your favorite Snapshots and upgrade them at the click of a button to create stunning realistic 3D Photos that show clients a true visualization of your interior design projects. Don’t let singular output make your online presence be just a “place”. Appearing in several places is essential to interior design marketing so that you can find and reach your market. With RoomSketcher you can generate, download and print your designs in multiple formats such as PDF, JPG, and PNG and in multiple sizes. Forget having to use several programs to create the image sizes and formats you need. Create high quality 3D visualizations of your interior design and decorating projects easily – whether it’s your own website or blog, an interior design website like Houzz, or social media channels such as Facebook, Instagram, or Twitter. There is no better way to show off your design work than with great professionally shot and styled photographs. A beautifully photographed completed project is the goal all interior designers and decorators strive for to promote our work. However, for a multiple reasons this goal is not always possible- we either don’t have a project yet, or the project is not complete, there are scheduling difficulties or the cost to have it photographed is not affordable. RoomSketcher 3D Photos give you the flexibility to reduce or even eliminate the need for photography while still being able to present your designs in an impressive and professional way. Reduce need, cost and wait time for professional photography and get your design work out there and working for you! RoomSketcher 3D Visualization can also help you prepare for a professional photo shoot. Save on costly preliminary site visits by sharing and reviewing your project in 3D with your photographer. Save time by pre-determining shots and anticipate your styling needs by virtually styling your 3D Photos. Don’t let project completion and photography wait times slow your interior design marketing down. Existing and potential clients love to see projects in progress – Promote as you go! Create professional before/after images using just the program to illustrate how you would design a room or to show off designs that are currently in progress. Share individual room designs or whole projects. Integrated social media links enable you to easily share your 3D floor plans, room design images and interior design projects. Enable your design projects with Live 3D interactive viewing technology and bring your designs to life! Allow potential clients to tour your design projects with Live 3D, as if they are actually there or to view a whole room design with the Panoramic Home360 viewer. RoomSketcher dynamic and interactive 3D project viewing features take your design portfolio to the next level. Whether you are sharing your work on your own interior design website, interior design blog or on social media Live 3D visualization will make design content fresh and exciting. You never know where you’ll meet your next client – Be Prepared! All RoomSketcher projects are stored online – in the cloud. Access your projects online anytime and anywhere you need them, on any mobile device. Just go online and your projects are ready to present on professional online Project Presentation pages. RoomSketcher makes it easy to have your Portfolio-To-Go!